Have to congratulate Al Gore. … so it wasn’t exactly out of the blue that Gore was awarded the Peace prize for his work on behalf of environmental awareness. So, a couple of weeks ago, Gore’s “campaign” to win the Nobel was widely enough known that we picked up on it even in this out of the way nanocorner of the ‘Sphere©. What was speculation (the Prize) is now fact. And so many other observers are taking a closer look at Gore’s presidential opportunity. So, two of L-HC’s usual suspects, Salon and Slate weigh in. Will Al Gore now run for the White House? Al Gore is a winner. Al Gore was right. One of the best things for Al Gore about winning the Nobel Peace Prize is that the sound bites are finally all on his side. For decades the two-term vice president has been championing environmental causes and until recently often received public scorn and derision. Now he’s been rewarded with one of the most coveted prizes on the planet. With the help of an interesting publication out of the UK, Spiked let’s put this prize into some context. On Monday, spiked will publish a series of articles on Al Gore, the Nobel and the climate change debate. As a preview, here is Frank Furedi explaining why Gore is a fitting winner of the ‘Nobel Fear Prize’. 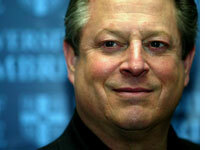 When I heard commentators this morning praising Al Gore as a ‘charismatic figure’, I waited around for the punchline. But they weren’t joking. Somehow, this dull provincial politician suffering from a charisma-bypass has been transformed into a hi-tech twenty-first century prophet – and now he has won the Nobel Peace Prize to boot. It is hard to tell if the reinvention of Gore is a testimony to the persuasive powers of PowerPoint, or to the collapse of the cultural and political imagination in the West. Probably, Gore’s emergence as a modern-day icon is a result of his ability to personify our culture of fear. He is the ideal spokesman for an era in which virtually every human experience comes with a health warning attached. Now, with his Nobel award, he joins a pantheon of cultural saints, including fellow Nobel recipient Mother Teresa. A bracing point of view. And welcome. And now for some perspective on Gore as a past presidential candidate, from an opinion columnist for the NYTimes. Yesterday began with the gratifying news that Al Gore, derided by George H.W. Bush as the “Ozone Man,” had won the Nobel Peace Prize. The first thing media types wanted to know was whether this would prompt Mr. Gore to elbow his way into the presidential campaign. That’s like asking someone who’s recovered from a heart attack if he plans to resume smoking. Mr. Gore, who won an Academy Award for his documentary on global warming, “An Inconvenient Truth,” and an Emmy for his cable TV network, Current, knows better than anyone else how toxic and downright idiotic presidential politics has become. He may be one of the most intelligent, thoughtful, talented men in America and remarkably well-equipped to lead the nation, but it’s Mr. Bush’s less-than-curious, less-than-distinguished son, George W., who is president. Especially useful is the comparison with (the even more hypocritical than most of his fellow hypocritical candidates in his hypocritical party) Rudy Giuliani. MIAMI, Oct. 12 — Somehow, it seemed only fitting that at the moment of Al Gore‘s triumph, George W. Bush would spend the day in Florida, scene of the fateful clash that propelled one to the presidency and the other to the Nobel Prize. What a difference seven years makes. The winner of that struggle went on to capture the White House and to become a wartime leader now heading toward the final year of a struggling presidency. The loser went on to reinvent himself from cautious politician to hero of the activist left now honored as a man of peace. No wonder conservatives are apoplectic – Gore’s fortunes rise as the president’s plummets. When Al Gore won the Nobel Peace Prize on Friday, conservatives reacted with apoplexy. Talk show hosts like Rush Limbaugh, conservative bloggers and other Republican faithful denounced the prize as a fraud…. The defensiveness of Gore’s critics comes because he is the ultimate rebuke to Bush. Gore, obviously, is the great historic counter-factual, the man who would have been president if Florida had a functioning ballot system. More than that, he is the anti-Bush. He is intellectual and introverted, while Bush is simplistic and backslapping. Finally, James Woudhuysen, again from Spiked, takes a most incisive look at the environmental movement itself, in the light of this latest event and symbol of its ascendency into the mainstream of political thought. How soft-headed can the Greens get? Keep reading. So, a refreshing change here for L-HC. It’s not been our experience in this space to date to have had the occasion to expose the practitioners of political correctness. PC comes from those drug-addled survivors of the ’60s that now set policy in so many institutions of higher education and non-governmental organizations. We are reminded, courtesy of Spiked, that the jerks of the right have no monopoly on wrong-headed moral certitude. But Al Gore, child of those same times, is not a jerk. And if he restrains himself from the temptations that his stellar year has exposed to him, he’ll remain one of the good guys. Either way, he deserves our congratulations. Al, direct your energies toward persuading your friends the Greens that technological solutions to our environmental challenges are perfectly appropriate. Then, perhaps they’ll retire the Peace prize with your name on it. This entry was posted on Sunday, October 14th, 2007 at 2:32 pm and is filed under Environment, Geopolitics, musings, Politics, Presidential election, Science, Technology. You can follow any responses to this entry through the RSS 2.0 feed. You can leave a response, or trackback from your own site.